Cs: Absolutely, like you said, in 2000 all of these things occurred all over the country, but the focus was on Florida, and some of them, like the provisional ballot, were in place by 2004, but by then, the damage had been done. Cm: The damage had been done. And, if you look at, this is one of the things that I like to say is that in the 2004 election we had the introduction of the electronic voting machines. Well, of course my home state of Georgia was the very first state to roll out these electronic voting machines from Diebold. The interesting thing is that approximately 80% of votes that are cast in the United States are cast on either Diebold or ES&S machines: these are electronic voting machines. Interestingly, though, Diebold is founded by one Urosevich brother, and ES&S is founded by the other Urosevich brother. So basically you’ve got in the hands of one family 80% of vote counting in the United States. Isn’t that amazing? Now in my 2006 election, I, well, the electronic voting machines broke down in the middle of the night, and of course I never regained the lead. But more than that, we were able to obtain affidavits from voters all over the state of Georgia who voted in my election. The interesting thing about that though is I only run in a district, a very compact, at that time, a very compact district. Cs: But people from all over the state voted in your election, against you? Cm: Well we don’t know because when we went to court to get the election data to see how those votes were counted, how they were treated, the court ruled that Diebold owned the election data. Diebold is the electronic voting machine company and they, even though it’s a public contract paid for by taxpayers, they owned the election data. So there’s no way to find out why the Fourth Congressional district race showed up on a screen in Atlanta, which is not in the fourth congressional district. Cs: Did you, were other races, were people able to vote in other districts, like were people in the fourth district able to vote in the third district races? Cm: We have no way of knowing exactly what happened because Diebold has the election data. Cs: Just the affidavits from the people from other districts that say they voted in yours? Cm: That’s exactly right, and we have people who voted for me, and we have people who voted against me, and they contacted us and said well you know, we don’t think it's right. Cs: You’re damn right it wasn’t right. Cm: And when they called us and said I was in the run-off, they said well we voted for you in the primary but now you’re not on the ballot for the run-off. We called those phantom votes, because they appeared one way but they disappeared in the runoff. And you know what the expert witnesses for the state said in court? That we have to "trust" them. Cs: So, what you’re saying is that the Secretary of State or the county Election Office does not own that data? The voting data--Diebold owns it? Cm: That’s exactly what I’m saying. If you ask for the election data, then the county and the Secretary of State’s office kicks the request over to Diebold and Diebold has the, since they own it, they have the discretion as to whether or not to turn that information over, and of course they say they can’t turn it over because it’s proprietary. Cs: Wow, wow, no, it sounds like it’s public information! Cm: It should be public information, and then on top of all of that, what we have are poor election administrators. They don’t know when a machine is malfunctioning during the voting process or not, so you could have a machine that is not even calibrated at zero at the beginning of the day, you have these machines that are vulnerable to hacking. You could walk in with a Blackberry and do a little this and that and you can change the vote tabulation literally right there. At the end of the day the machines are all hooked up to telephone lines. Now guess what, telephone lines allow the hacking to occur as well. I’ve participated with Bev Harris in several experiments where literally before our eyes we saw the election data change the tabulation because of outside interference. Now, if we add to that a very real situation that happened in 2004, and that is that in the presidential election, the vote counting and tabulation took place on Republican owned machines. So, if you privatize your democracy, then you’ve basically placed the right of representation and the right of self-determination in the hands of private corporations. That is what the people of the United States have done. Cs: It sounds not like a democracy but fascism. Cm: And the Democratic Party is part and parcel of the problem because even though they have a majority and have had a majority since 2007 they have done nothing to insure election integrity. Cs: Right, and also, in Florida in 2000 and Ohio in 2004 the Secretaries of State were both chairmen of the Republican parties in their separate states. Cm: That’s exactly right, so in Ohio you had the man, Blackwell, and in Florida you had Catherine Harris, and I served with her in the House, and she was rewarded for stealing the election with a Congressional seat. Because I did an investigation to expose, you know we brought Choice Points Vice president in and made him swear, then that’s how we found out just exactly the mechanism they use, and in fact, as I recall, what the VP told us was that the State of Florida asked for an inaccurate list—they asked Choice Point to give them a list that wasn’t accurate so they could have the discretion to deny rightfully registered people the right to vote. It’s all a plan. Cs: Yeah, for sure, and you know, they’re just playing these games with people’s lives. Cs: Yes, they called it the “legitimate government,” but when our elections are stolen we just go, “oh well. That’s the way things go.” I really admire the people of Mexico; I think they’re really radical. Well, speaking of Mexico, Venezuela also votes on voting machines. However, when they vote the person gets a receipt. The person checks the receipt and makes sure everything that he or she voted for is correct, and then it goes into a ballot box to be audited if there’s a need for that. You know, even if it’s not the ideal system, it’s better than the system in place in many places in the United States. Cm: Well, we could have had that. There was a gentleman by the name of Athan Gibbs, he was from Tennessee, black man by the way, an accountant, so he understood that you had to have first, second, third ways in which to verify the numbers you were getting were accurate. He (Gibbs) came up with a system, that I believe was open source as well, so there was none of this proprietary this and proprietary that. Basically he was able to provide a receipt, and that receipt was auditable, but of course your vote was still anonymous, and the interesting thing about Athan Gibbs, was he came to Georgia, I had him here, I was fascinated, he was trying to get the contract really for Georgia, which was the first one to introduce these Diebold voting machines in the country, and he didn’t get the contract. I had introduced him to the appropriate people at the Secretary of State’s office and he didn’t get the contract, but of course Diebold had lobbying muscle and they had actually hired the previous Secretary of State, so, of course, they had that kind of muscle and Athan Gibbs just had an interesting machine. Interesting thing happens, I’m out in California, and I get a phone call, Athan Gibbs is dead. How in the world, what happened, because I had asked Athan to come to California with me to demonstrate his machines? The very next week he was to go to Ohio to testify that it is possible to have electronic voting machines that are accurate and that are reliable and accountable to the voter. Cm: Before he was able to make that testimony. It appears that a 16-wheeler truck had been idling for quite a while, and just as Athan comes down the expressway, the road, the truck pulls out and Athan dies in a car crash. He’s not the first person though who has died in a mysterious kind of way who had information about election fraud in the United States. There was another man, who was a Republican insider, and he had information too, and he died in a plane crash. Cs: I just got chills about that, that’s horrible. In 2000 and 2004, voter fraud is well documented, it’s not a conspiracy theory, in Ohio there were things that happened that were statistically impossible, but of course we don’t believe in statistics or science in the US, we believe in myths, we believe in fairy tales, but what happened in 2008? Was that election stolen, you know, are our elections only stolen if a Republican wins? Or because we know most of these people who do election protection or integrity are progressives, or Democrats? So in 2008, I believe Obama got 52% and I believe McCain got around 47%, so what happened? And in this answer I want you to include what you found out in that COINTELPRO document about what was promulgated in 1965. Cm: In 2000, we saw election fraud that was by means other than electronic voting machines. 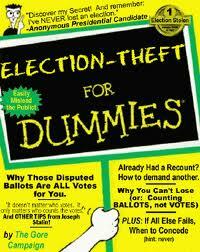 In 2004, we saw election fraud by means of electronic voting machines and other means as well. And nothing happened to change the platform on which elections are administered in our country, for the 2008 election; in fact, the insidious proprietary voting machinery was used even more widely, so therefore, if nothing was done to improve the situation, everything remains the same. Cs: And long lines, and in white communities there’d be like 8 or 10 machines you know, no lines, so you know, besides them controlling the machines they still do stuff like that, but in 08 we don’t hear about that, not one thing. Cm: Well we had a situation that arose in Georgia where one of our constitutional officers was on the verge of really stopping the election because of the vote flipping that was going with the voting machines in Georgia. Now can you imagine deploying a machine that can’t function in the heat, and in Georgia you’ve got 70% humidity and 90 degrees and the machines break down because of the heat. But then that particular constitutional officer was pulled off the election, so if you get the desired result, you really don’t complain. But really the desired result ought to be an accurate reflection of the will of the people, that’s why we go to vote, and that’s called self-determination, anything that diminishes what we know the will of the people is a diminishment of our right to self-determination, and that’s a human right, and our rights are being diminished literally right before our eyes and the people who we entrust with the responsibility to look out for our interest, they really are shirking their responsibility and the only people who suffer in the end are the ones that really count. Cm: ...And he’s presiding and ruling us out of order as we’re trying to fight for him. Cm: …he lost before he even began the campaign, that was one of the most ludicrous examples of someone running, he said, "sure just put my name on the ballot," that was a disservice to the people. You see, n the South, we have a little bit different view of things because down here we are accustomed to fighting the Democratic Party, because at the time of my birth the Democratic Party was a white-only party, that was their law, and if a white person wanted to participate in politics, they had to be a Republican, so we see things differently. When the Democratic Party became the party of hope for black people then we gave all of our hope over to that party, and that was during the Civil Rights struggle. It had begun before that, with the Franklin Roosevelt Administration, with the issuance of jobs and that sort of thing, but really it was during the Civil Rights movement, and there were real victories that, well we were actually fighting the Democrats, because the Democrats in the south were Dixiecrats, they were boll weevils, they were the solid South, and the solid South at that time was a South against the idea of black voting, so really this idea of black people being so wedded to the abusive spousal relationship to the Democrats, who are still sending their children off to die in war, who are still giving money to bankers who really don’t need it, who are investing their hopes in a Social Security system and a Medicare system, but black people don’t even live long enough to take advantage of these programs. For us, to invest all of our hope in a political party that has a multitude of interests and ours come last on the totem pole is really quite politically dysfunctional, and then we have the rise of a black candidate that talks about hope.